A&A Coatings has been the steady supplier of thermal spray coatings for the Pulp and Paper industry. Paper Mills, Pulp Mills and Tissue Mills have many corrosive processes while running abrasive papers. Any piece of equipment or part that contacts the product is a candidate for wear, abrasion and corrosion resistant coatings. Our thermal spray experts spend long hours in the lab to ensure that products such as felt rolls, reel drums, and steam hoods are coated with desirable properties based on your needs. Resistance to wear within Pulp and Paper industrial processes is of utmost importance. The products processed through this machinery can be extremely abrasive and will quickly wear out the components and parts that they come in contact with. A&A Coatings is an industry leader in offering wear resistant coatings to the pulp and paper industry via our highly specialized Plasma and HVOF Thermal Spray Coating processes. 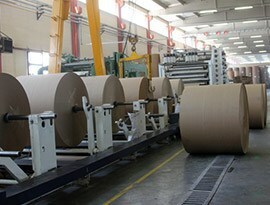 Paper carrying rolls and other mechanisms within the Pulp and Paper process are not only subject to wear but they also require very specific surface finish requirements to facilitate traction between the roll and the paper. A&A Coatings offers many different materials and surface finishes to support this need of the paper industry. The manufacturing and processing of Pulp and Paper is an extremely corrosive process. A&A Coatings offers many solutions to not only prevent this corrosion in the equipment but to repair and recondition corroded or worn out components. From starch tanks to winder drums to slitter rolls, we can ensure that the right coatings are applied so that your equipment can work efficiently over an extended period of service lifespan. Because A&A Coatings has served many paper mills, pulp mills and tissue mills over the years, we are confident that our industry experience can help businesses in the paper and pulp industry meet their unique needs. Give us a call today to find out more!